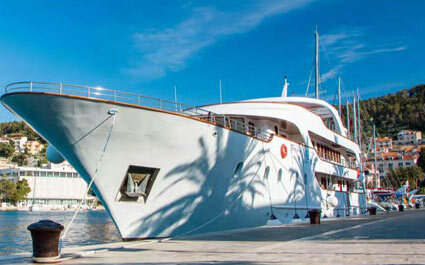 Deluxe category cruiser Futura alongiside at Hvar harbor You’ll need more than one trip to discover the 101 delights of Dalmatia - the rugged coastline of Croatia, protected by a gorgeous Adriatic archipelago and backed by the dramatic mountains. We have sailed earlier on the northern route, leaving the central area hopefully for another occasion. 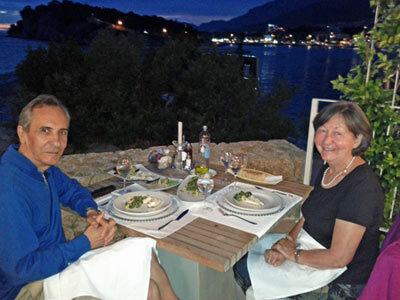 This summer we took the southern route, and asked our good friends Rita and Massimo Brandinali, from Bologna, Italy, to be our guests. 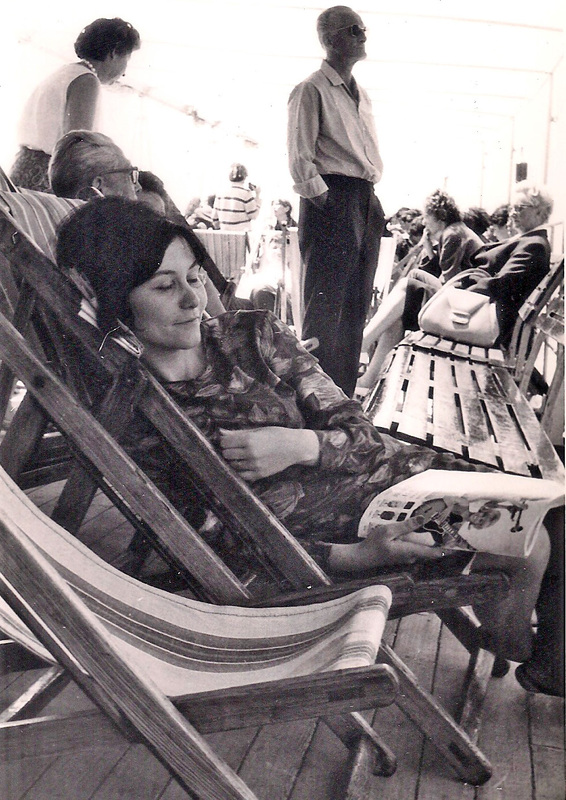 Starting from Split, where Maja and I traveled to on the day we married in Dubrovnik, 50 years ago - well dressed, spending the first wedding night in deck chairs on a coastal liner. Now we are in jeans, having deluxe accommodations and service for 7 days. Nearly 2,000 years ago the Riva, one of Europe’s finest seafront promenades, won the heart of Roman Emperor Diocletian who hoofed it to Split after he abdicated. A guided tour takes us in his footsteps, visiting his palace, a lavish colossus with vaulted basements and a graceful colonnaded courtyard, Peristil, is the town’s most remarkable man-made attraction. Walking out through the Old City, you squeeze down the narrow Pusti me da Prodjem (Let me Pass) streets. 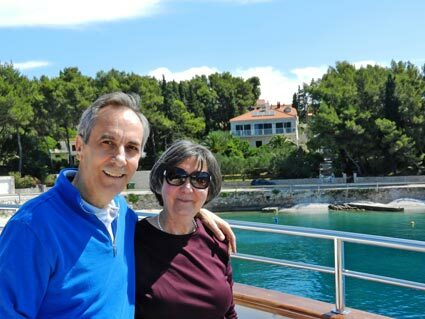 Captain Damir Naranca did us a favor and passed by the Zunic family home in Sumartin on the Island of Brac, and we sent our greetings by the ship's horn and a wave. 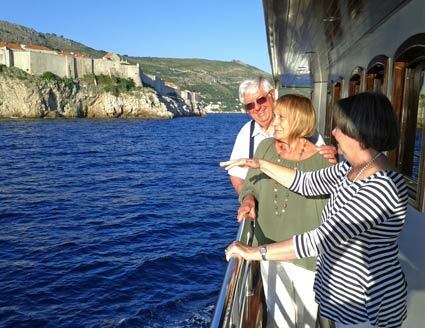 On the visits to Split, Korcula and Trstenik, Pelješac we met with our old friends, while in Dubrovnik, for a day and two nights, it was too short a time to greet all the friends and Maja’s family. 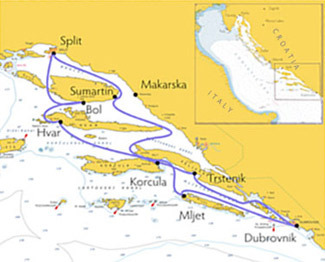 The highlight of the cruise was the visit to Palmizana Island; an exciting taxi boat ride on Mistral waves from the town of Hvar, and dining on fresh local seafood and wine. 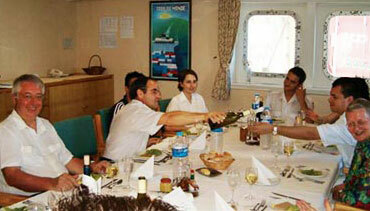 Captain’s dinner followed on the last night of the cruise, while the vessel was resting alongside at Bol, island of Brac. At the table, Captain Naranca is the first on the right, then Massimo and Rita, tour manager Tanja, myself and Maja, and Spanish guests, Ana and Tomas. 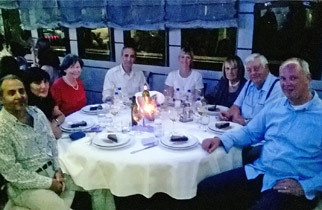 One of the topics at the table was our common satisfaction with the cruise: a variety of destinations, from the Mljet National Park, the vineyards and wineries of Grgic and Milicic on the Pelješac Peninsula to historic and cultural centers like Split and Dubrovnik. 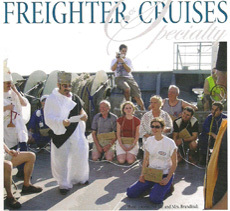 What attracts them to freighters is a relaxed, friendly atmosphere among passengers, officers and crew, similar to what we found here on the Futura in a small group of 27 guests, coming from Australia, Canada, Italy, Spain and the USA. 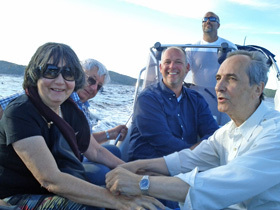 On larger cruise ships, by contrast, this quality is lost, as is the intimacy with the sea and nature. Early in the morning, before the vessel sailed from Bol back to Split, Maja and I disembarked to spend a couple of days in Sumartin with relatives and friends, and a night at the Hotel Osejava in Makarska, where we lodged 50 years ago following the night traveling at sea and sleeping in deck chairs.